Buying an accent chair for the special man in your life? Whether it is for the man cave or his home office, your living room or bedroom, you can find a piece with character. Why sacrifice style or comfort when you can have both? 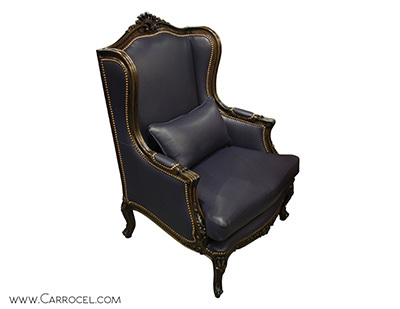 At Carrocel Interiors, we have one-of-a-kind items from around the world to match your man’s unique personality. Our staff will be happy to show you around the showroom as you browse our finest accent seating collection. 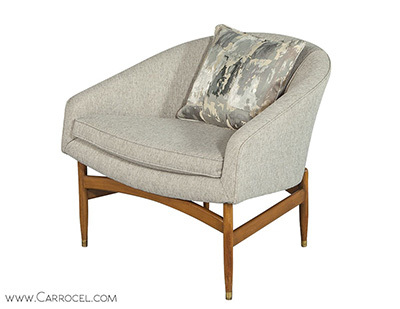 Charm him with the classic look: Our Mid-Century Modern Armchair will be the star in any room. This gorgeous barrel back chair was created in the 1960s and has the classic Milo Baughman look. Your man will love the muted dove grey tone, soft woven texture, low height and deep seat. 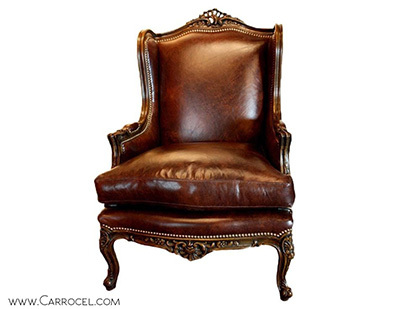 Make him feel like a king: This Carved Louis XV Styled Leather Wing Chair makes the ideal throne for the king of your heart and home. 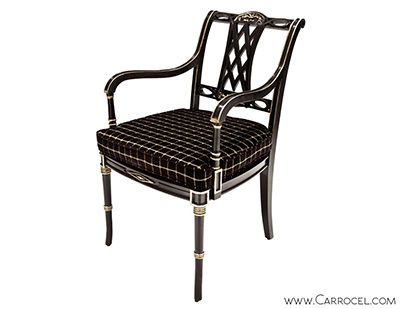 A combination of class and elegance, this custom finished and upholstered Italian-made chair will add a regal look to an office, parlour room or even your living room. Celebrate his distinctive personality: Our Carved Library Office Wing Chair in Blue Leather oozes character. The rich Italian blue leather with dark espresso finish and hand placed nails will show off your man’s personality and style. While typically used in an office or parlour, this versatile piece can make a chic addition to your living room or bedroom furniture as well. Showcase his style: Finished in a sleek black lacquer with antique silver leafing, our unique Black Lacquered Regency Living Room Armchair is a fine expression of stylish elegance. Upholstered with black and silver fabric, we offer you the option of customizing the upholstery and finish for an additional charge. Dare to be different: Our Lucite Accent Chair will add a bit of whimsy to your space. It’s vintage and here to stay…just like your man! The triangular base frame, slightly curved back, upholstered seat and chrome button fittings on joints pack a punch that is hard to ignore. Come to the Carrocel furniture store for beautifully-made living room and bedroom accent seating. For over 30 years, we have provided high quality accent seating for living rooms and bedrooms in Toronto and around the world. Our unique collections and stellar quality please homeowners with diverse tastes. Clients appreciate our attention to detail and exceptional customer service which sets us apart from other furniture stores. With periodic shipments coming in regularly, we offer new items and stylish decorating ideas almost every time you visit our huge showroom in Toronto. 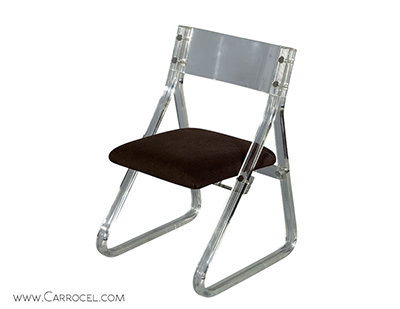 To check out our wide variety of accent chairs, visit the Carrocel furniture store today. Call us at 416-999-2525 or contact us online to arrange a free consultation.